Goodbye Jeep, Hello Volt. – Planet Geek! Considering the hybrid/electric car market, the field is somewhat limited. Obviously the Prius is king, and while it’s a nice car, it wasn’t something I could get behind. The Nissan Leaf is also a great (all electric) car, but the lack of an engine meaning it had a fixed range, and couldn’t be used for long road trips, and I do those on occasion. I didn’t want to go with some of the simpler hybrids that only provided mild performance gains… and then I started looking at the Volt. Several folks up at MakeIt Labs have Volts, and in talking with them I learned a lot. Then I started running the numbers. A Volt runs on it’s battery until the battery is depleted, then switches over to an onboard engine. This makes it’s range effectively infinite, but for the first 35-40 miles, it runs on pure electricity. Gosh, that’s pretty close to my one way commute. I checked in with the folks at work, and got a “Sure, you can plug it in here” response. Suddenly I had a car that I could drive to and from work, and not use a drop of gas. A car that could also go on long road trips, and get decent mileage for that (somewhere around 35mpg). 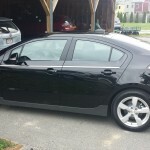 I started conversations with Colonial Chevrolet in Acton (I’ve gotten my last 2 cars from Colonial, and been very satisfied with both sales and service.) They had a couple Volts, and I went in for a test drive. There is very little to compare to driving an all electric vehicle at highway speeds. Smooth, quiet, has great pickup, and knowing that you’re burning zero hydrocarbons… it’s awesome. I was hooked. After some negotiation, I settled on leasing a new 2015 Volt for 3 years. We set the miles per year in the contract, and today I said goodbye to my Jeep and drove off in a shiny black 2015 Chevy Volt. Not all of this is peaches and cream. While I know I’m doing the right thing – I’m doing the most energy efficient thing I can do to in my commuting situation… this change will impact me in several ways. Cargo – I moved things in the Jeep. It had a huge back space (the Passat did too), but the Volt cargo space is much smaller. I’m not sure how well that’s going to work, but we’ll see. No AWD/4WD. I live in New England. This past winter was the snowiest we’ve ever had. The Jeep was phenomenal for this, and I never felt trapped – I knew I could always get out and get where I wanted to go. That’s no longer the case. I don’t know how this is going to impact me, but I’ll need to watch for it. It’s not cool. Okay, it is cool, but in a very different way than a Jeep is. I won’t wave at other Wranglers I see anymore (and they always waved too). I wonder if Volt owners wave? There’s sure a lot less of them. There’s still more things I have to do. The Volt can recharge on house (110v) current, but it’s a slow process. 8-10 hours for a full charge. A fast charger will cut that down to 3-5 hours, but that requires a 240v outlet and a new charger connection. Still working out how best to manage that. 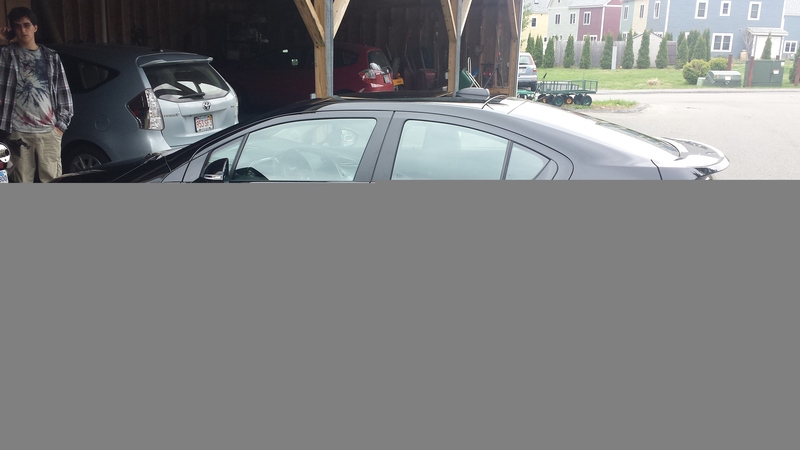 For now I’ll use my car port and normal 110v recharging. But…. I now use an electric car for 90% of my driving. How cool is that?